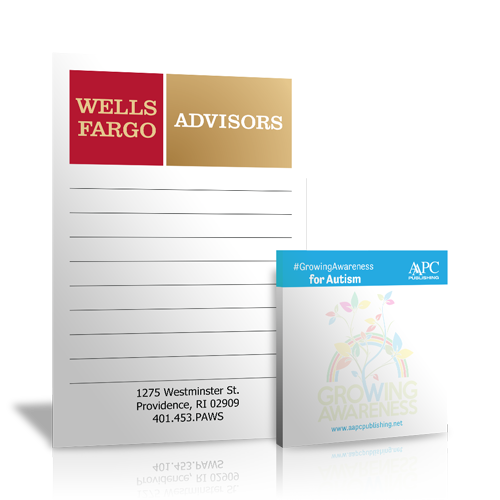 You have a choice of ruled paper, blank paper or imprint each page with a custom black or color ink imprint. Ruled paper has gray lines, is college ruled and the lines are printed on both sides of the sheet. Paper weight is premium 20LB bond. 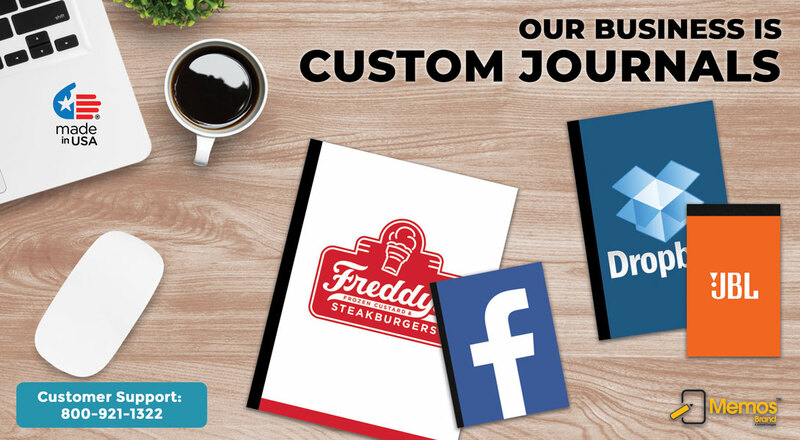 Your custom imprint is allowed only the front of each inside sheet. 2. Print the front of the cover and the inside of the front of the cover (available on quantities of 48 or more). This product can be bound on the 4.25" side of the book or the 5.5" side of the book. • Heavy 2 Ply White Back Cover with Printing on outside of back. Only available on quantities greater than 48. • Heavy 2 Ply White Back Cover with Printing on both sides of back cover. Only available on quantities greater than 48. 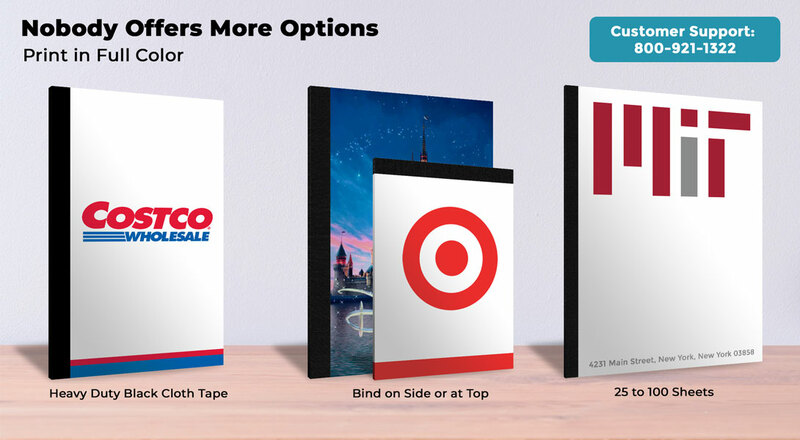 Superior quality custom journal notebooks sized 4.25” x 5.5” from North America’s largest manufacturer of custom notebooks for over 19 years. Select from 3 front cover weights where you can fully customize the front cover with your text and images. Using the STEP 2 calculator on the left, you can see all the customization options available for this product. After you complete STEPS 1 thru 3 in the calculator on the left, you will be given the option to design your product online in our design studio or if you choose, you can download a pre-sized template and create your product design offline at your leisure and then upload your design in STEP 3 on the left. We also give you the option to work with one of our talented graphic designers to design the perfect product. 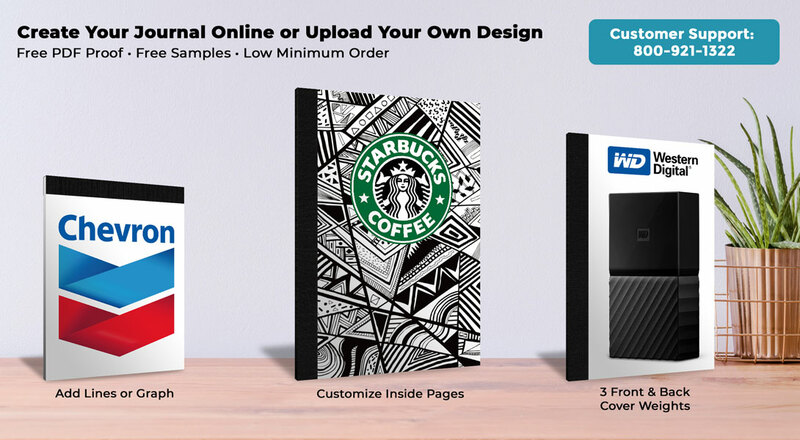 You have full access to our image library so you can design a spiral notebook to fit any occasion. Use the product calculator on the left to see our standard customization options. Size: 4.25” x 5.5”, bound on the 4.25" side. Front cover printing is available in 1, 2, or 3 ink colors as well as in full color. You also have the option to print the inside of the front cover (available on 48 books or more). Heavy brown chipboard back is standard. Other options include ultra-heavy back. Printing is not available for the back cover. Select college ruled or plain paper. You can customize the inside pages (minimum 48 books). Typically, the inside sheets have the same image on every page. If you require inside sheets that have multiple images, please contact Customer Support (800-921-1322) for a quotation. Heavy cloth tape binding on the top or side of the notebook featuring black, white, dark blue and red tape colors.